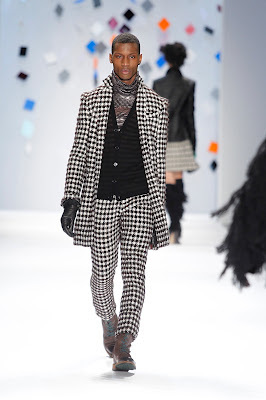 The Wright Wreport: Day 4 MBFW: Custo Barcelona Brings It. Wow! Day 4 MBFW: Custo Barcelona Brings It. Wow! ONCE the Wow! started it would not stop until the last. It took Custo Barcelona to get the word out of my mouth. Custo Barcelona pays tribute to visionaries and other artistic types. Photo courtesy of Custo Barcelona. BEST OVERALL SHOW – One knows what to expect from Custo Barcelona: a panoply of prints. Always, however, is the question of how will designer Custo Dalmau merge them. A disclaimer: Custo Barcelona is not for the faint. These are not materials for the masses, and thank God for that. For fall 2012, homage is paid to visionaries and the pioneers of creativity. The result is a brilliant patchwork of wool both, geometric-shaped and graphic boiled, as well as leather, metallic patterns, technical finished fabrics and some others. The men are dressed a tad more demurely than normal; a few suits are so accessible that JCPenney might reach out. As usual the ladies have as much on as they can carry. Visionary colors include red, black green, taupe, wine, purple, brown, copper. Under the pattern rubric are houndstooth, plaid, paisley and whatnot. As usual, it is a lot for the eye to take in, yet it does and the effort doesn’t show. (Study closely the ensem pictured at right). By the by, don’t be mislead by the word “patchwork,” craft is woven into every piece, from the most rococo to the most restained. Either CD is a good editor or he seeks counsel from one, for his myriad moving parts flirt inexorably with the danger of overkill without ever quite going there. (Enjoy the video above). OTHER MENTIONABLES – Turn the attention away from Tracy Reese for a few seasons and return to find that the coquettish schoolgirl that she references has developed some harder edges. Since moving from the heartland to city center our darlingl has replaced her bookish reading glasses with mannish sunglasses. The over-the-knee socks and floral dresses have been moved to the back of the closet. Within easy reach are metallic patterns with cut velvet and bare legs. She’s wearing pants these days, too. In case the parents visit, though, she can dig up the orange/purple dress with black-scalloped sleeves. Mommy and daddy’s little girl is growing up. From the look of things DKNY is rebelling against slouchiness. Photo by Michael Dills/Getty Images. Diane von Furstenburg and her partner in design, Yvan Mispelaere, imagine their DVF woman stepping out for a rendez-vous. That is, “a meeting with suspense and expectation,” DVF explains. She is dressed for the occasion in a confident brown off-the-shoulder wool jersey layered dress. Because a shroud of mystery hangs over the proceedings, she might choose the sleeveless black crepe satin dress w/folds and dropped-waist leather belt. On her arms opera gloves, which she likes with any number of rendez-vous rags. Depending on her mood or that of the weather, she could summon a bright color like citrus (halter top), gold (tapered pants). DVF offers a well-crafted, accessible collection. While not strenuously creative, it is clever. Ladies, in a black mood for fall? Then set the GPS for DKNY. In these times of revolution, the designer is feeling a little poetic rebellion, beat style. Yet no woman of Jack Kerouac’s or Amiri Baraka’s showed at a slam got up in any threads as city slicker sleek&chic as the black turtleneck and high-waisted croc flared skirt or either one of the furry ensems in the wine group. They are emblematic of a collection that skews heavily toward self-possession and sophistication. Photos by Astrid Stawiarz and Craig Barritt/Getty Images. Photos by Craig Barritt and Fernanda Calfat/Getty Images. Photos by Craig Barritt and Mike Coppola/Getty Images. Photos by Michael Dills and Frazer Harrison/Getty Images. Photos by Frazer Harrison and Michael Dills/Getty Images. Photos by Frazer Harrison/Getty Images and Courtesy of Custo Barcelona.